Awaiting its “soft opening” at the October St. Paul Art Crawl, the “Art by Skill Crane: Mni Wiconi Gallery of Bottle Art,” is beyond description. The machine evokes the waves and flow of water, reinforced by the words found above, Mni Wiconi, “water is life” in Lakota. A closer look at the framework of the machine brings you face to face with a variety of art pieces, water bottles, lights, recycled and found items, wooden sculptures, shells, stones, and jewels. Take a peek inside and you will find recycled water bottles containing prints, paintings, mobiles made of found items, and so much more. After marveling at the machine, you might decide to play, because after all, it is a crane machine. But your awe won’t stop there, not after learning that this beautiful and unique art project is the creation and handiwork of young people from the American Indian Youth Enrichment (AIYE) summer program, an initiative of the Department of Indian Work at Interfaith Action of Greater Saint Paul. With a grant received from the Minnesota State Arts board, and the vision and guidance provided by local artist and AIYE teacher/volunteer MaryBeth Garrigan, the AIYE summer program was able to integrate art deeply and more meaningfully into the experiences of their youth. “We want our kids to have another outlet of expression to represent themselves and their culture through art.” shared AIYE program Coordinator Virginia Vogel. During the 7-week summer program, about 50 youth worked on the project Art by Skill Crane, through building and designing the framework, and supplying the crane machine. Working alongside five professional artists in art studios found in the Schmidt Artist Lofts, youth experimented with a variety of art styles and tools to build the project, connect with their cultures, and develop an expanded knowledge and appreciation for art. The Art Skill Crane was only one part of the summer program. The program’s theme this year is “Mni Wiconi,” a concept extremely relevant to the youth and to the current socio-political context regarding the Dakota Access pipeline protests. Focused on the element of water, many of the activities youth engaged in also related to water. Youth met with a graduate student of the U of M for a lesson on water treatment. Field trips to sacred sites, such as Minnehaha Falls and Bdote, allowed youth to contribute to the preservation of these sites through picking up trash (all of which was used to decorate and supply the art crane) and learning their history. Teachers in the program also shared cultural stories related to water. Ultimately, youth explored how essential water is to their culture, history, lives, and world from environmental, cultural, and artistic perspectives. When asked about any unexpected outcomes that occurred with the art project, both Virginia and MaryBeth expressed their surprise about how interested and invested the youth were in the art. “Even the teachers were like ‘This one kid was having a tough day, and then he sat down and started painting, and it was calm” Virginia recalled. Chuckling to herself, MaryBeth pointed out how, “The art room was probably the calmest classroom, because the kids were so focused. And then the students wouldn’t want to leave, or they’d ask us when they could go back to the studios. It was great!” Evident in the positive remarks shared by Virginia and MaryBeth, the art project has positively impacted the youth, program staff, and the artists who volunteered, in ways unimaginable. 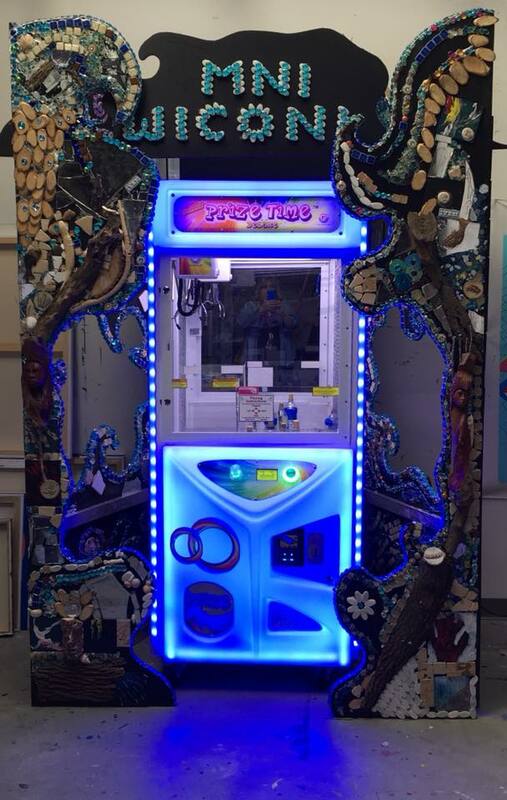 The hope for MaryBeth, Virginia and the rest of the AIYE program is that this Art by Skill Crane will be the first in a series of crane machine art projects, each phase highlighting one of the four elements: water, earth, air, and fire. But before that, the larger community will have the opportunity to engage with the art project. On October 12, 13, 14, during St. Paul Art Crawl, the machine will be operational for its “soft opening,” where individuals will have a chance to witness and play the machine. All money will go directly back to the AIYE program. On Sunday October 21st, the art project will have its grand debut at Can Can Wonderland.